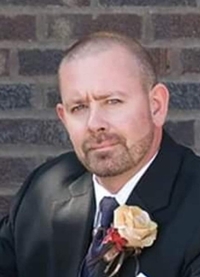 ROCKY ALLEN CADDELL, 42, of Lewis, Indiana and formerly of Jasonville passed away at 10:00 p.m. Wednesday, October 31, 2018 in Terre Haute as the result of an automobile accident. He was born June 19, 1976 in Sullivan, IN to Greg Thompson and Jeaninne (Caddell) Sayers. Survivors include his children, Gracey Caddell of Hymera and Ally Caddell of Hymera; step-children, Evan Hege-Caddell of Farmersburg, IN and Jaden Hege-Caddell of Farmersburg, IN; mother, Jean Sayers (Darrell Clayton Jr.) of Bloomfield; step-father, Jon Hubbell of Jasonville; siblings, April Fortin (Rick) of Crawfordsville, Christopher Hubbell (Leah) of Linton, Harley Hubbell (Jeff Bessling of Jasonville, Meah Hubbell (James Cole) of Linton, Eli Thompson of Hymera, Misty Thompson of Jasonville; many nieces and nephews. He was preceded in death by his father, Greg Thompson; maternal grandparents, Sterling and Rosemary Caddell; paternal grandparents, William and Maxine Thompson; step-father, David “Pete” Sayers; uncle, Timothy Caddell; aunt, Pam Kirk. Rocky was a graduate of Shakamak High School Class of 1994. He worked construction and his last job was with Hubbell Construction in Jasonville. Rocky like to go muddin’ and work on trucks. He loved his nieces and nephews, and his music. He enjoyed Laffy Taffy, Many Chewing Gums, Now and Laters, and Red Man “Big Spit”. Arrangements are entrusted to Michael W. Cox, Cox Funeral Home; 218 South Meridian Street; Jasonville, Indiana. Visitation is scheduled from 5 to 8 p.m. Monday. Funeral Services will immediately follow visitation at 8 p.m., Monday, November 5, 2018 at the Cox Funeral Home with Pastor Mark Messmer officiating. Private Family Burial is scheduled. Interment will be at Peavey Cemetery in Howesville, IN. In lieu of flowers contributions may be made to the Cox Funeral Home to help with funeral expenses. Envelopes are available at the funeral home.